Earlier in The Wire, we learned how the drug war is very similar to a chess match, in the way certain pieces can be correlated to the different positions in the drug business. In “One Arrest,” we return to that metaphor, but now instead we see strategy. As a fan of chess (though hardly a master), you learn quickly that there are no small decisions. Every move you do, no matter how small, is serving a grand strategy. If a move looks so simple and so easy, the better—your opponent will read it as nothing, and then be astonished later when the secret is revealed. “One Arrest” is all about this the application of this strategy—we see a series of small plot developments, all in order to serve a larger purpose. The episode is written by Rafael Alvarez, the first time either the creator David Simon or his writing partner Ed Burns have not been at the forefront (they do take the story credit however). However, you wouldn’t notice any change unless you read the credits. Mr. Alvarez, who wrote crime for the Baltimore Sun for twenty years and then wrote for Mr. Simon on Homicide: Life on the Streets, is obviously right up the alley with these guys, and as Sidney Lumet would say, works because everyone is making the same show. But onto the episode. We begin with the crew who have become more adept at picking up and using the wire taps on the payphones, and pick up a bust on packs coming into the low rises. Greggs, Herc, and Carver take the car as it approaches, but they only take the delivery guy—if they take the driver, the wire taps will be compromised. Unfortunately, the man they take is Kevin Johnston, the young boy Prez blinded back in “The Detail.” So Daniels makes the next small step—he buys him some candy and a soda. “Call me if you want to change your life around,” he offers. Kevin laughs it off, but once again, a small step might go a long way. 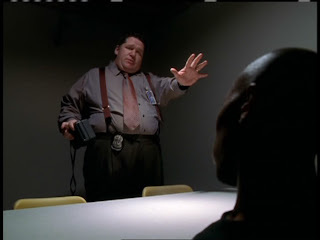 The main focus of the episode then shifts the McNulty and Moreland, working the death of William Gant, the murder witness killed in the pilot. The crew arrested Bird Little after a tip from Omar is corroborated by an elderly woman decides to speak up. 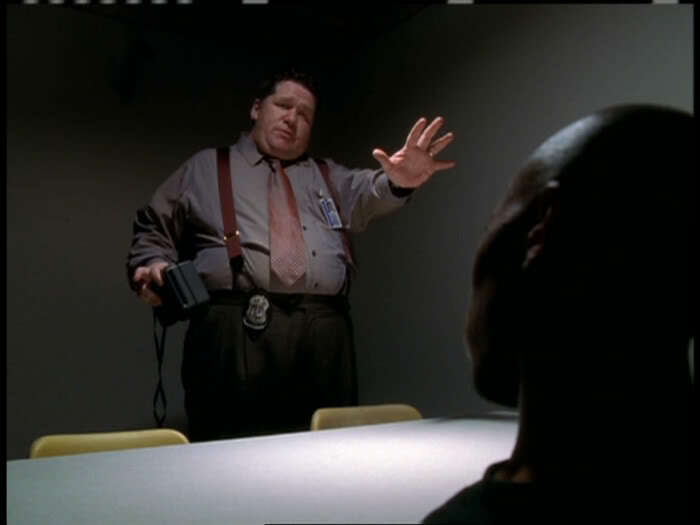 In what is one of the show’s great scenes, Greggs attempts to interrogate Bird and make him give up anyone. It doesn’t work. He keeps swearing at her and seems impossible to break. Daniels comes in. He take the photo they took to show they didn’t hurt him and tears it in half. The crew goes to work. Should we applaud Daniels and the crew for doing what is necessary? While 24 explored violent interrogation techniques with a strong right wing agenda, The Wire gives us a more balanced approach in this scene that refuses to take sides. The director, Joe Chapelle, doesn’t allow us to see in the room, just the audio. The effect is an astonishing one—the camera can’t revel in the violence, nor can it condemn it. It is up to our own personal opinion to decide. 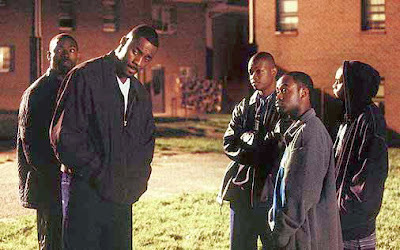 At the end of the episode, Stringer and Avon visit the low projects, still rattled that their stash has been caught, and distraught that the driver got away. Their first guess was that there was a snitch, but they move on from that idea—another rule of chess, is that you can never play the same strategy throughout the game, but most constantly switch what you are doing. Avon tells the boys the rip out the payphones and never use the same phone once. We see Lester Freamon look on as their wiretap goes out. And thus why the strategy is both a gift and a curse. Small moves can draw suspicion, and lead to a good defense. How will the cops respond? A strategy change is in order.